Arrows Sent Forth: There's more than corn in Indiana. 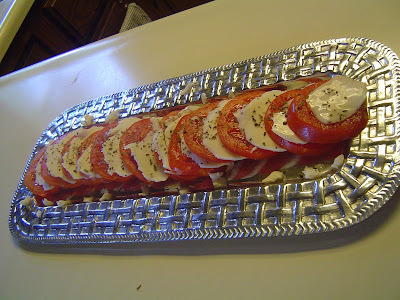 Last week I made the classic caprese salad for some very happy Brits we had over for dinner. I say they were very happy because apparently tomatoes are not as plentiful across the pond as they are in Indiana in the summer. These beauties were overflows from my sister's garden. Feast your eyes on this platter of yummy Hoosier goodness. So there it is, three ingredients. Tomatoes, mozzarella, and basil (wish I would have had fresh basil, but a few sprinkles of the dry stuff worked just fine). A pretty well known combo, for certain, but there is a reason classics become classics. This post is part of WanderFood Wednesday at Wanderlust and Lipstick. Check it out to see what everyone is eating this week. What are your favorite simple recipes (I won't hold you to 3 ingredients... but maybe 5 max)? Three-ingredient dishes that the kids will eat - I love it! this is one of my favorite dishes - yours looks so pretty! I love caprese salad especially when the ingredients are fresh from our own garden. Yum!